The Twinners Reviews & Giveaways is super close to 1000 Google followers and 1000 Twitter followers, so they decided to do a special giveaway! 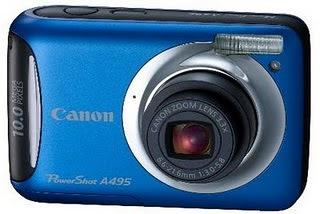 and they're giving away a brand new Canon PowerShot A495 t to one of their readers. Whoever that winner, he/she must be really lucky to get it! Lol And, if they get to 1500 followers on BOTH Google AND Twitter by the April 30th deadline, they'll do a separate drawing for a $25 gift card to Amazon.com! wowza! I know you want it.. ~wink~ So what are you guys waiting for? Click here for more deets!